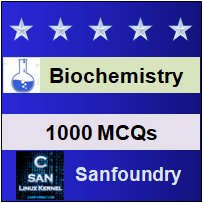 This set of Biochemistry Multiple Choice Questions & Answers (MCQs) focuses on “Metabolic Fates of Amino Groups”. Explanation: Glutamate is metabolically converted to α-ketoglutarate and NH4+ by a process oxidative deamination catalyzed by L-glutamate dehydrogenase. Explanation: The free ammonia is combined with glutamate to yield glutamine by the action of glutamine synthase. Explanation: All aminotransferases have pyridoxal phosphate (PLP) as cofactor. Explanation: Pyridoxal phosphate functions as an intermediate carrier of amino groups at the active site of amino transferases. Explanation: The first step in the catabolism of most L-amino acids once they have reached the liver is removal of the α-amino groups promoted by enzymes called amino transferases or trasaminases. Explanation: The combined action of aminotransferase and glutamate dehydrogenase is referred as transdeamination. Explanation: In the tissues of intestine, liver and kidneys, the amide nitrogen is released as ammonium ion in the mitochondria, where glutaminase converts glutamine to glutamate and NH4+. 8. Which of the following operates at an important intersection of carbon and nitrogen metabolism? Explanation: Glutamate dehydrogenase operates at an important intersection of carbon and nitrogen metabolism. Explanation: Trypsinogen is converted to its active state by enteropeptidase, a proteolytic enzyme secreted by intestinal cells. 10. Which of the following hydrolyzes successive amino-terminal residues from short peptides? Explanation: Aminopeptidase hydrolyzes successive amino-terminal residues from short peptides.